Tomorrow The Fates Divided will be released and I was really hesitant to read another thing more by Veronica Roth after getting again disappointed by Allegiant. I was pleasantly surprised and think I might really like it. I give Carve the Mark by Veronica Roth three out of five hearts, because this book is trying to be an epic space opera but doesn’t get there (yet). The story felt a lot like a Romeo and Juliet story, Cyra and Akos are both taught to hate the others race/nation (what exactly it was, wasn’t clear). But both give each other a chance to see if the hate between them is worth it and eventually fall in love. I think the love aspect could have been left out, it’s not important, Akos has enough reason to save Cyra when she gets caught. Akos’ mother is an oracle, but doesn’t do much in this story when she finally shows up. Which was a bit worrisome. The same goes for a (little) thing with Cyra’s blood. I was missing a lot of information on that because it pulled me out of the story. I found the end a big jaring, there was still so much going on and suddenly there was the last page. I hope she doesn’t do it again in The Fates Divide because it is not much fun. I also have an issue with the amount of times that the word ‘currentgift’ is used, are there really know other words you can use to describe what she has? 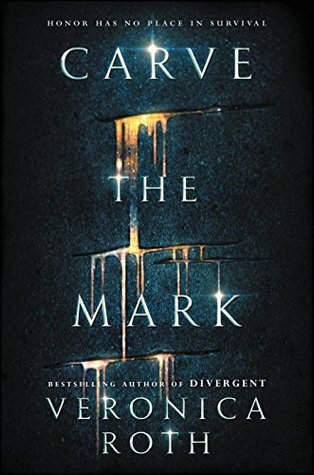 Overall I think Carve the Mark has a lot of potential, but it is not using it very well. I initially gave it four hearts, but after writing my review I actually had to change it to three because it wasn’t really worth the extra heart. This entry was posted in Book Review and tagged Adventure, Book Review, Drama, Fantasy, Romance, Science-Fiction, Veronica Roth. Bookmark the permalink.